DC Locator « Jorge's Quest For Knowledge! Today while helping another Directory Services MVP regarding the troubleshooting of DC Locator in Windows 7 (also applies to W2K8R2 server), a bug was found. While the Windows 7 client knew the AD site it was in, it was still doing a DNS query for siteless SRV records instead of doing a DNS query for site based SRV records. When you restart a client computer that is running Windows 7 or Windows Server 2008 R2 in an Active Directory domain environment, the Net Logon service starts before the network interface is initialized. This behavior causes the status of the network adapter to change to intermediate. Additionally, this behavior causes the IP address to change even though the network adapter is assigned to the same IP address eventually. In this situation, the client computer uses site-less LDAP DNS Server (SRV) records (_ldap._tcp.DnsDomainName or _ldap._tcp.dc._msdcs.DnsDomainName) to locate the domain controller (DC). If this issue occurs in an environment in which only the hub DCs for the site-less SRV records are registered in DNS, and if the client computer’s remote branch site is disconnected from the hub site, then the client computer cannot locate a DC. However, the local branch DCs are available in DNS when the hub DCs cannot be reached from the branch site. Therefore, the client computer does not recognize the local branch DCs as DCs. This issue occurs because the Net Logon service invalidates the cached site information in the registry prematurely. If you enable debug logging for the Net Logon service by using the method that is described in Microsoft Knowledge Base (KB) article 109626, you receive a sequence that resembles the following. The sequence indicates how the site name is invalidated. 10/20 13:20:01 [CRITICAL] IPV6SocketAddressList is too small 0. 10/20 13:20:01 [SESSION] Winsock Addrs: 169.254.237.187 (1) Address changed. Windows DCs register a set of service locator records in DNS to be able to service both windows and non-clients. The complete list of service (SRV) records is specified below with an explanation of the service that’s represented, including which clients used it. By default. Windows DCs register all available service records. This is OK for datacenter located RWDCs. For RWDCs not located in datacenters, the RWDCs need to be told not to register the domain-wide SRV records. This can be achieved through the registry or through a GPO. The latter of course is preferred and a best practice. For more information about how to configure RWDCs NOT to register specific mnemonics see this blog post. RODCs by default only register site-wide SRV records, so no need to use a GPO to tell the RODC not to register domain-wide SRV records. The NetLogon service on a DC, during boot and regularly (every hour, and previously that was every 24 hours), is responsible to registering the correct service records. The service records that will be registered are listed in the “netlogon.dns” file in the “C:\Windows\System32\config” folder. An example of this file is shown below. The addition of the _msdcs subdomain means that two sets of DNS names can be used to find an LDAP server: DnsDomainName is used to find an LDAP server or Kerberos server that is running TCP (or, in the case of a Kerberos server, either TCP or the User Datagram Protocol [UDP]), and the subdomain _msdcs.DnsDomainName is used to find an LDAP server that is running TCP and also functioning in a particular Windows Server role. The name "_msdcs" is reserved for locating WIndows domain controllers. The single keyword "_msdcs" was chosen to avoid cluttering the DNS namespace unnecessarily. Other constant, well-known names (pdc, dc, and gc) were kept short to avoid exceeding the maximum length of DnsDomainName. The list that follows provides the definitions of the names associated with registered SRV records. It also describes the lookup criteria supported by each record and the checks performed by Net Logon as each record is registered. Text in bold type denotes constant record components; text in italic type denotes variable names. In the descriptions of registered SRV records, DnsDomainName refers to the DNS domain name that is used during creation of the first domain controller when the AD domain tree is joined or created (that is, while the computer is running the Active Directory Installation Wizard). DnsForestName refers to the DNS domain name of the forest root AD domain. The following is a list of the owner names of the SRV records that are registered by NetLogon. An owner name is the name of the DNS node to which the resource record pertains. Allows a client to locate a server that is running the LDAP service in the AD domain named by DnsDomainName. The server is not necessarily a domain controller — that is, the only assumption that can be made about the server is that it supports the LDAP application programming interface (API). All Windows Server–based domain controllers register this SRV record (for example, _ldap._tcp.adcorp.lab.). Allows a client to locate a server that is running the LDAP service in the AD domain named in DnsDomainName in the AD site named by SiteName. SiteName is the relative distinguished name of the site object that is stored in the Configuration container in Active Directory. The server is not necessarily a domain controller. All Windows Server–based domain controllers register this SRV record (for example, _ldap._tcp.amsterdam._sites.adcorp.lab.). Allows a client to locate a domain controller (dc) of the AD domain named by DnsDomainName. All Windows Server–based domain controllers register this SRV record. Allows a client to locate a domain controller for the AD domain named by DnsDomainName and in the AD site named by SiteName. All Windows Server–based domain controllers register this SRV record. Allows a client to locate the server that is acting as the primary domain controller (also known as a "PDC") in the AD domain named in DnsDomainName. Only the PDC emulator FSMO of the AD domain (the Windows Server–based domain controller that advertises itself as the primary domain controller to computers that need a primary domain controller) registers this SRV record. Allows a client to locate a Global Catalog (gc) server for this AD forest. Only domain controllers that are functioning as Global Catalog servers for the AD forest named in DnsForestName register this SRV record (for example, _ldap._tcp.gc._msdcs.adcorp.lab.). Allows a client to locate a Global Catalog (gc) server for this AD forest in the AD site named in SiteName. Only domain controllers that are serving as Global Catalog servers for the AD forest named in DnsForestName register this SRV record (for example, _ldap._tcp.amsterdam._sites.gc._msdcs.adcorp.lab.). Allows a client to locate a Global Catalog (gc) server for this AD domain. The server is not necessarily a domain controller. Only a server that is running the LDAP service and functioning as the Global Catalog server for the AD forest named in DnsForestName registers this SRV record (for example, _gc._tcp.adcorp.lab.). REMARK: In Windows Server, a Global Catalog server is a domain controller. Other non-Windows 2000 implementations of directory services can also register servers as Global Catalog servers. 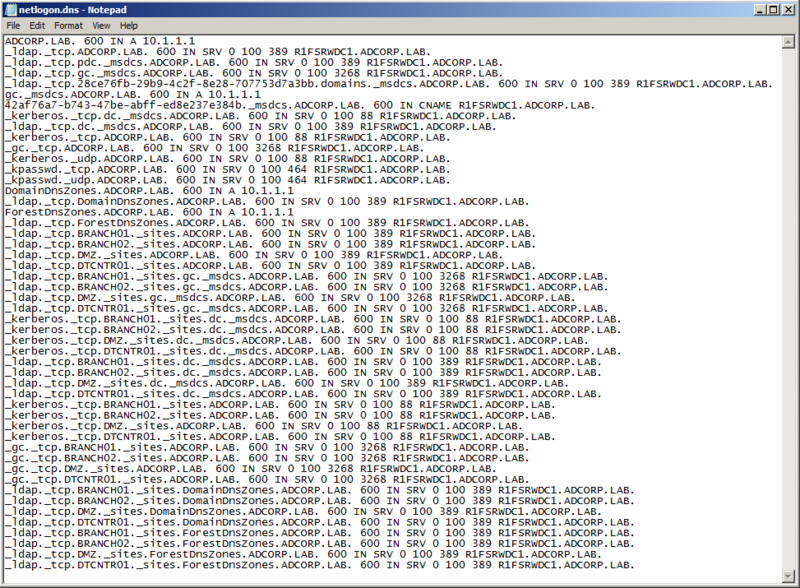 Allows a client to locate a Global Catalog (gc) server for this AD forest in the AD site named in SiteName. The server is not necessarily a domain controller. Only a server that is running the LDAP service and functioning as the Global Catalog server for the AD forest named in DnsForestName registers this SRV record (for example, _gc._tcp.amsterdam._sites.adcorp.lab.). Allows a client to locate a domain controller in an AD domain on the basis of its GUID. A GUID is a 128-bit number that is automatically generated for referencing objects in Active Directory – in this case, the AD domain object. This operation is expected to be infrequent; it occurs only when the DnsDomainName of the AD domain has changed, the DnsForestName is known, and DnsForestName has not also been renamed (for example, _ldap._tcp.4f904480-7c78-11cf-b057-00aa006b4f8f.domains._msdcs.adcorp.lab.). All domain controllers register this SRV record. Allows a client to locate a server that is running the Kerberos KDC service for the AD domain that is named in DnsDomainName. The server is not necessarily a domain controller. All Windows Server–based domain controllers that are running an RFC 1510–compliant Kerberos KDC service register this SRV record. Same as _kerberos._tcp.DnsDomainName, except that UDP is implied. Allows a client to locate a server that is running the Kerberos KDC service for the AD domain that is named in DnsDomainName and is also in the AD site named in SiteName. The server is not necessarily a domain controller. All Windows Server–based domain controllers that are running an RFC 1510–compliant Kerberos KDC service register this SRV record. Allows a client to locate a domain controller that is running the Windows Server implementation of the Kerberos KDC service for the AD domain named in DnsDomainName. All Windows Server–based domain controllers that are running the KDC service (that is, that implement a public key extension to the Kerberos v5 protocol Authentication Service Exchange subprotocol) register this SRV record. Allows a client to locate a domain controller that is running the Windows Server implementation of the Kerberos KDC service for the AD domain that is named in DnsDomainName and that is also in the AD site named in SiteName. All Windows Server–based domain controllers that are running the KDC service (that is, that implement a public key extension to the Kerberos protocol Authentication Service Exchange subprotocol) register this SRV record. Allows a client to locate a Kerberos Password Change server for the AD domain. All servers that provide the Kerberos Password Change service (which includes all Windows Server–based domain controllers) register this name. This server at least conforms to "Kerberos Change Password Protocol”. The server is not necessarily a domain controller. All Windows Server–based domain controllers that are running an RFC 1510–compliant Kerberos KDC service register this SRV record. Same as _kpasswd._tcp.DnsDomainName, except that UDP is implied. If multiple domain controllers have the same criteria, multiple records exist with the same owner name. A client that is looking for a domain controller with specific criteria would receive all the applicable records from the DNS server. The client would pick one of the returned records to select a domain controller, as described in the RFC "A DNS RR for specifying the location of services (DNS SRV)." NetLogon registers the following DNS A records for the use of LDAP clients that do not support DNS SRV records (that is, that are "non-SRV-aware"). The Locator does not use these records. Allows a non-SRV-aware client to locate any domain controller in the AD domain by looking up an A record. A name in this form is returned to the LDAP client through an LDAP referral. A non-SRV-aware client looks up the name; an SRV-aware client looks up the appropriate SRV resource record. Allows a non-SRV-aware client to locate any Global Catalog server in the AD forest by looking up an A record. A name in this form is returned to the LDAP client through an LDAP referral. A non-SRV-aware client looks up this name; an SRV-aware client looks up the appropriate SRV resource record. Allows a client to locate any domain controller in the AD forest by looking up an A record. The only information that is known about the domain controller is the GUID (“objectGUID” attribute) of the directory system agent (also known as the "DSA") object (“NTDS Settings” object) for the domain controller and the name of the AD forest in which the domain controller is located. This record is used to facilitate renaming a domain controller. Priority – The priority of the server. Clients attempt to contact the server with the lowest priority (a.k.a. lowest (cost)value). Port Number – The port where the server is listening for this service. Target – The fully qualified domain name of the host computer. When your DCs are logging the "NO_CLIENT_SITE" warning in the NETLOGON.LOG file, it depends on whether you can/should ignore it or not. I will explain the reason through examples by how it works and also the reasoning of why you can ignore it or not. WHY THE "NO_CLIENT_SITE" ERROR OCCURS….. When a computer is domain joined it knows for sure of which AD domain it is a member. A domain joined computer may or may not know the AD site it is in. Even if it thinks it knows the AD site, it may not even be in the correct AD site (e.g. because it was moved, or AD site was renamed, etc.). For the remaining part of the text I will just mention "computer" instead of domain joined computer. It queries DNS with "_ldap._tcp.<SITE NAME>._sites.dc._msdcs.<FQDN AD DOMAIN>"
Based upon the IP Address of the computer (and without using its subnet mask! ), the RWDC/RODC will check if it can match the IP address of the computer to an AD subnet (as specific as possible). Assuming the RWDC/RODC can match the IP address to an AD subnet and the AD subnet is linked to an AD site, the RWDC/RODC will tell the computer in which AD site the computer is in, in which AD site the RWDC/RODC is in and the "close proximity bit" specifying if the RWDC/RODC is in the same AD site as the AD client. It queries DNS with "_ldap._tcp.dc._msdcs.<FQDN AD DOMAIN>"
The computer contacts the RWDC (through LDAP ping, UDP:389). Assuming the RWDC can match the IP address to an AD subnet and the AD subnet is linked to an AD site, the RWDC will tell the computer in which AD site the computer is in, in which AD site the RWDC is in and the "close proximity bit" specifying if the RWDC is in the same AD site as the AD client. Assuming it can match the IP address to an AD subnet and the AD subnet is linked to an AD site, the RWDC will tell the computer in which AD site the computer is in, in which AD site the RWDC is in. The computer will then repeat the process as specified in option  above. When a user then logs on to the computer, the AD domain information and the AD site information known to the computer will be used to find a DC and authenticate the user. So if the computer knows in which AD site it is in, to authenticate the user it will query DNS with "_ldap._tcp.<SITE NAME>._sites.dc._msdcs.<FQDN AD DOMAIN>" and follow the steps as specified above in . The steps above apply for authentication WITHIN the same AD forest and also BETWEEN AD forests or BETWEEN AD domains in different AD forests. Taking the first scenario as an example. When a user is logged on to the computer and the user wants to access a resource in another AD forest, it will query DNS with the following query: "_ldap._tcp.<SITE NAME>._sites.dc._msdcs.<FQDN OTHER AD DOMAIN>". Although it uses the FQDN of the AD forest the resource is in, it will use the AD site of the computer it is logged on to. If the AD site also exists in the other AD forest, then the steps as mentioned in step 1 will be used. If the AD site does not exist in that other AD forest, then the steps as mentioned in step 2 will be used, but then using <FQDN AD OTHER DOMAIN>. However, step 2d will be a little bit different. Based upon the IP address of the computer the RWDC of the other AD forest/domain will check if it can match the IP address of the computer to an AD subnet (as specific as possible) in the other AD forest . [.B.] If the RWDC in the other AD forest cannot match the IP address of the computer to an AD subnet in the other AD forest OR if it can match the IP address to an AD subnet in the other AD forest but the AD subnet in the other AD forest is not linked to an AD site in the other AD forest, the RWDC will then service the computer AND log the error "NO_CLIENT_SITE" in the NETLOGON.LOG file (C:\Windows\Debug). Within the same AD forest, if you get the "NO_CLIENT_SITE" error, it is not recommended to ignore this. To get rid of these errors make sure an AD subnet exists and that it is linked to an AD site. However, between AD forests it is very likely that this error occurs because the AD subnet structure and/or the AD site structure is different. Even if a match can be made, it may not even be the most optimal one to use. as the meaning of each AD site may be different. If you can ignore these errors or not between AD forest depends on the specific scenario. In the case of locating a DC to access the SYSVOL/NETLOGON, the authN DC creates two referral lists. The first list contains the DCs (in random order) from the same AD site of the AD client. The second list contains all the other DCs outside the AD site of the AD client. "Site Costed Referrals" are NOT enabled by default on W2K3 SP1/R2 DCs. Requires registry setting. The configuration for "Site Costed Referrals" for the default domain DFS and the custom DFS namespaces is done in a different way! Targets in the same Active Directory site as the client are listed in random order at the top of the referral. Next, targets outside of the client’s site are listed in random order. If no same-site target servers are available, the client computer is referred to a random target server no matter how expensive the connection is or how distant the target is. Next, targets outside of the client’s site are listed in order of lowest cost to highest cost. Referrals with the same cost are grouped together and within each group the targets are listed in random order. This applies to BOTH default domain DFS and the custom DFS namespaces! AD sites with an RWDC automatically have an ISTG and also have an automatic failover process. By default the very first RWDC in an AD site always becomes the ISTG. The selection of a new ISTG depends on the FFL. AD sites with an RODC do not have ISTG because RODCs do not register as one. Register an RODC as ISTG manually so that it is able to calculate the cost-matrix for the site-costing functionality. Downside is that there is not auto failover when the RODC becomes unavailable or is replaced by another RODC. REMARK: RODCs by default only register site-wide SRV records, so for an RODC this is not needed! In W2K you had to configure the registry of each BO RWDC. Another solution was to create your custom ADM file and load that in the GPO that was targeting the BO RWDCs as specified in (2), (3) or (4). The main disadvantage was that custom ADM files tattoo the registry, meaning that undoing the setting was done through the usage of an exact reverse/opposite setting. In W2K3 new GPO settings were introduced for this, so it was not need to use custom ADMs. The default available ADMs did not tattoo the registry whereas undoing meant you have to remove the GPO setting and set it to NOT CONFIGURED. "Computer Configuration\Administrative Templates\System\Net Logon\DC Locator\DNS Records"
"DC Locator DNS records not registered by the DCs"
For the GPO "Branch Office DCs Settings" configure DENY READ & APPLY for the global security group "GSG_HUB-DCs"
Add new HUB DC to group "GSG_HUB-DCs" (if you forget this step the new HUB DC will behave as a BO DC by first applying the Default Domain Controllers GPO and then the "Branch Office DCs GPO Settings" GPO. It will therefore only auth. clients which query DNS for DCs that provide site-wide auth. for THAT site. REMARK: the thought here is that it is most likely to add an additional or new BO RWDC then a HUB RWDC. You can of course turn it around and use the group for BO RWDCs and the group then needs READ+APPLY and you need to remove APPLY for Auth. Users. This option can become quite a mess as you end up with a separate child OU and a separate GPO (or link one GPO to multiple OUs, but then what is the value of having multiple OUs?) for each BO having an RWDC. I do not recommend going for this option. If I had to make a choice it would be either  or . Choose whatever is easier for you to manage. If you ask Microsoft you will most likely hear to use . !!! You should NOT (NEVER!!!) create multiple OUs under the Domain Controllers OU to delegate permissions to "non-Domain Admins"!!! This is the 3rd and last part of "DC Locator Process in W2K, W2K3(R2) and W2K8"
This is the 2nd part of "DC Locator Process in W2K, W2K3(R2) and W2K8"
GPO setting path: "Computer Configuration\Administrative Templates\System\Net Logon\DC Locator DNS Records"
GPO setting: "Try next closest site"
Continued in part 3 of the "DC Locator Process in W2K, W2K3(R2) and W2K8"
This is the 1st part of "DC Locator Process in W2K, W2K3(R2) and W2K8"
GPO setting: "DC Locator DNS records not registered by the DCs"
If you have configured your branch office DCs to not register domain-wide specific records, the clients will use those DCs and fail over to the datacenter if the local DC becomes unavailable. However if the local DC comes back online the client keeps using the datacenter DC until the client is restarted or the datacenter DCs become unavailable for some reason. Apparently it does not rediscover its local DC is available again. MS-KBQ939252 provides a hotfix and registry configuration for Windows XP (SP1 & SP2) and Windows Server 2003 (SP1 & SP2). The registry configuration is the ability to configure a discovery interval for the locator process. Make sure you also see MS-KBQ247811, as there it mentions: "After the client locates a domain controller, the domain controller entry is cached. If the domain controller is not in the optimal site, the client flushes the cache after fifteen minutes and discards the cache entry. It then attempts to find an optimal domain controller in the same site as the client." Continued in part 2 of the "DC Locator Process in W2K, W2K3(R2) and W2K8"